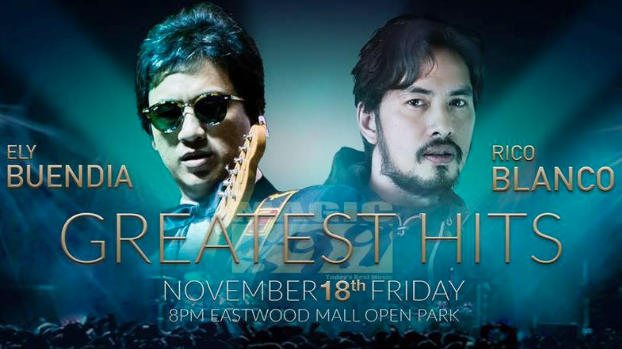 Ely Buendia and Rico Blanco To Sing Greatest Hits on One Stage this November! Ely Buendia and Rico Blanco: both frontmen of now-iconic bands of the late 90s who have paved their own path through solo endeavors and various acts. Rivermaya and Eraserheads may have butted heads in the past – or at least, some of their fans have – but for one night, OPM fans are in for a treat as Rico and Ely perform their greatest hits… for free! The announcement was made via Magic 89.9’s Facebook page, and the event will be in celebration of the radio station’s 30-year anniversary. It would surely be sold out even if there were tickets sold, but as a treat to the station’s listeners, admission will be absolutely free at the Eastwood Mall Open Park on November 18. Ely Buendia, on the other hand, got his start in 1989 as he helped form one of the most successful and influential bands in Philippine history: the Eraserheads. Since their controversial break-up, however, he has been a part of numerous bands of varying genres through the years, including The Mongols, Pupil, The Oktaves, Apartel, as well as his own solo career. Both have had similar paths, but truly distinct sounds and bodies of work that have captured the hearts of Filipinos around the world. Seeing the pair singing their greatest hits on one stage will truly be a once-in-a-lifetime event that can’t be missed. What songs do you hope Ely Buendia and Rico Blanco will perform on November 18? Leave a comment below!